What was once an annual tradition, the LaSalle St. Patty's Day Parade was missed for many years. Three years ago, the parade was resurrected, and a new annual tradition was begun. 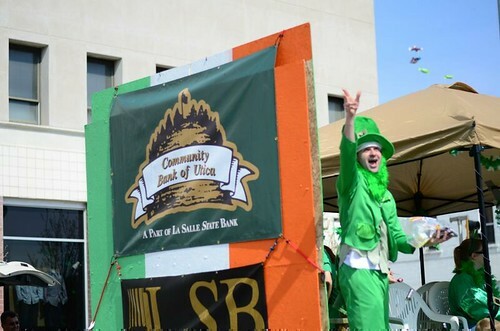 On Saturday, March 16th at 1 o'clock, LaSalle will once again host it's "Annual" St. Patty's Day Parade. To help celebrate, we will be serving corned beef and cabbage all day on Saturday and again all day on St. Patrick's Day. We serve a generous 8 oz. 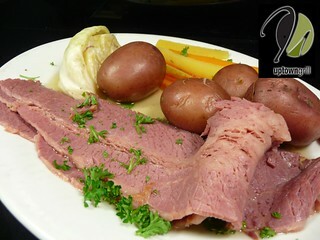 portion of corned beef and fresh vegetables (not canned or frozen); steamed cabbage, baby carrots and boiled whole new potatoes. Come down and watch the parade, then celebrate with us. The story of the connection between corned beef and cabbage, the Irish and St Patrick's Day is convoluted and somewhat unclear. It appears that this connection was American in origin rather than Irish. Organized St. Patrick's Day parades may have begun sometime around 1845 in the Northeast United States, but there is no mention of corned beef connected to these early celebrations. There are several theories, or perhaps more correctly, legends about the emergence of corned beef being associated with the Irish. One which seems to have a ring of authenticity about it, asserts that this began occurring after the U.S. Civil War. As we know many thousands of Irish, many newly immigrated to America, fought on both sides. Corned beef, which by its very making is designed to resist spoilage, was one of the staples of the military diet. The story goes on to suggest that many of the poor Irish were thus introduced to this delicacy (for them) and carried this taste back to their homes. Corned beef being relatively cheap, ultimately became a staple on the tables of the Irish. Whatever the origin, corned beef and cabbage is now and forever associated with the Irish and St. Patrick's Day. as mine and ours have done for you and yours."